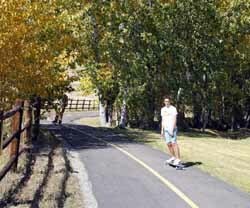 A skateboarder takes advantage of balmy weather Thursday to cruise down the bike path along Sun Valley Road. Record-setting high temperatures are forecast for the region for today and Saturday, cooling to a high of 59 in Ketchum by Monday. Forecast highs for Ketchum are 83 today and 82 on Saturday; for Hailey, 88 today and 87 Saturday. The National Weather Service keeps no records for Ketchum or Hailey, but it does for Stanley and Twin Falls. In Stanley, record high for Oct. 1 and Oct. 2 is 79; forecast high there today is 82 and for Saturday is 81. In Twin Falls, record high for Oct. 1 is 89; forecast high for today is also 89. Record high for Oct. 2 is 86; forecast high for Saturday is 90. What’s better, reading an e-book or traditional books?